“THE old band’s back together,” explains HiFX Spain’s new Country Manager Tanya Edwards as she settles into life in Marbella. The money transfer company has been experiencing a period of intense growth and having just moved to the Golden Mile, Edwards is confident that this will continue. Having originally worked in HiFX head office in Windsor from 2005, she is delighted about being reunited with former colleague, Operations Manager Amanda Best. 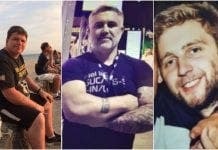 They are fronting up the Spanish operation from Centro Plaza, in Nueva Andalucia, Marbella, having worked together for years. Located behind Yanx restaurant, with breathtaking views towards the mountains overlooking Marbella, the team of five want to get across to clients how happy they are to deal with them personally and not to feel rushed. “I want people to feel comfortable enough to drop in, have a cup of coffee and find out what their options are,” Edwards explains. Having transferred over £100 billion, HiFX is one of the largest international money transfer specialists in Europe, offering highly competitive, bank-beating exchange rates to both individuals and businesses. 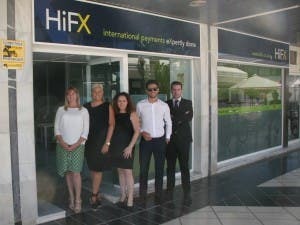 With three offices in Spain, HiFX cover the whole of the Iberian Peninsular including the Balearic and Canary Islands. Now part of Euronet Worldwide, a global electronic and transaction processing solutions company, HiFX offers a personal service with each dealer serving fewer clients than a bank, giving them more time to find the best rates on offer. And it is an exciting time for the team and – most importantly the people they work with – as the property market takes off. “Seeing the market come back round again really excites me,” Edwards explains. “But what excites me even more is seeing the estate agents and the other businesses we work with prosper”. Spain is certainly once again a firm favourite for those looking to buy abroad, according to the company’s latest Property Hotspots Report. The bi-annual report, which analyses nine years worth of HiFX data, reveals that while France and Spain shared the top spot in March, Spain is now steaming ahead and attracting more buyers. Meanwhile across the pond, the USA continues to be a popular choice for British house-hunters exploring the global property market, as 8% of those searching abroad head there. “Looking at the global property market broadly, the last six months have been very interesting,” explains UK-based director Mark Bodega. “While demand for international property remains well below pre-financial crisis highs, we’re beginning to see pockets of demand off the back of strong price performances in a number of key countries. But it is not all work and no play at HiFX. As Edwards explains, the new ethos at HiFX is to give back to its affiliates. As well as lining up a quiz night in October, (expect your invites soon) and gearing up for Estepona’s overs 50’s show, the HiFX team are getting sporty. “We have got massively into our sports this year,” says Edwards. • Jose Ivars-Lopez – Head of Banking Partnerships – Based at HiFX Windsor and heads up not only Spain, but the banking affiliations in the UK and Spain.